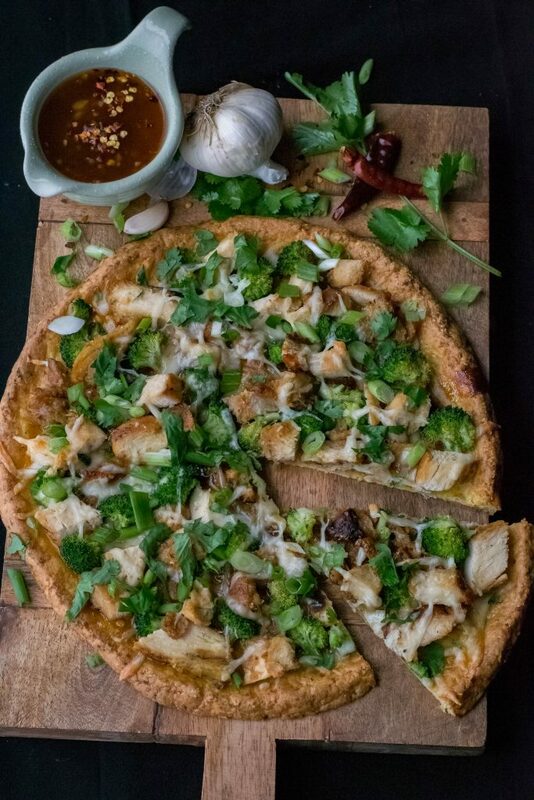 Sweet Chili Chicken Pizza with Cauliflower Crust - What the Forks for Dinner? 28 pizza recipes and counting…….from breakfast……Potato Crusted Breakfast Pizza….to dessert Strawberry Pretzel Pizza and everything in between. Pizza world….we’ve got you covered. 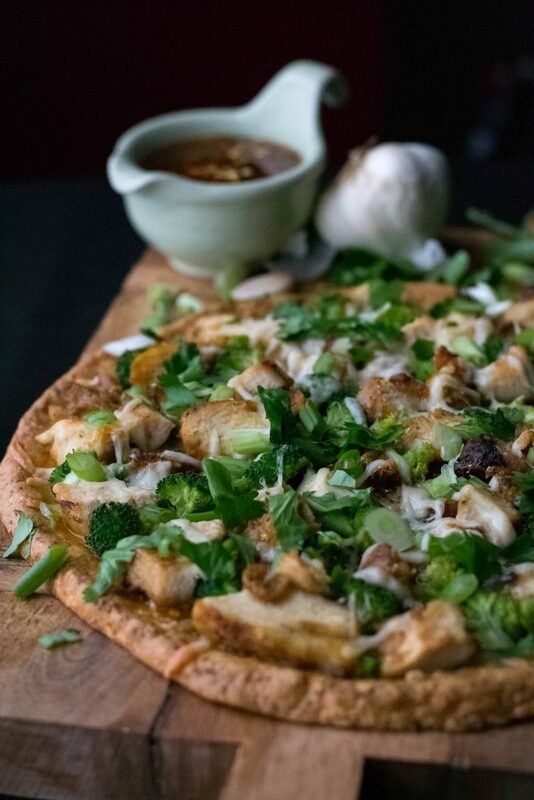 Pizza #29 came from wanting to try a cauliflower crust and thinking about the sweet chili chicken wrap….a combo was in the making! First, let me say that the cauliflower crust is the bomb!! Easy to make, using frozen riced cauliflower…my new best food friend. 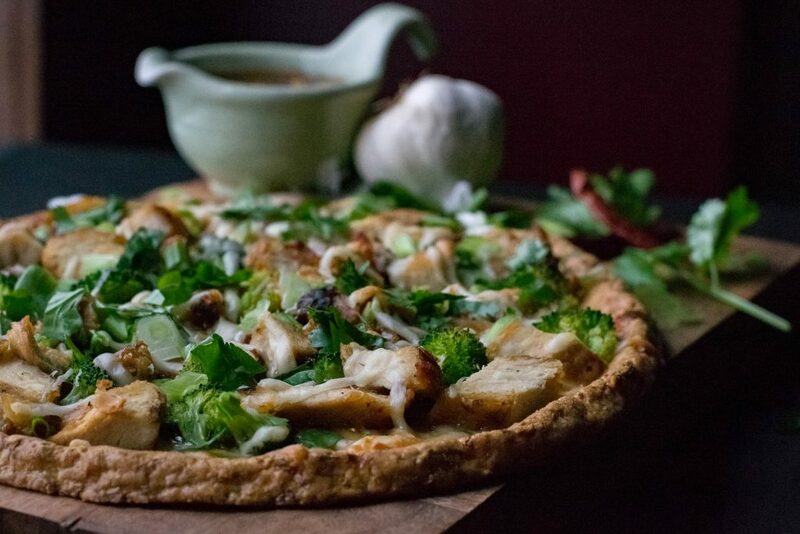 Just a few ingredients and you have a….whatever your diet choice……awesome pizza crust. Make sure your cauliflower is as dry as possible. I cooked mine for a few minutes then lined a mess sieve with cheesecloth. Let it cool to the touch then squeeze the daylights out of it. When you think you have it dry….squeeze it one more time. Use a piece of parchment paper no matter what you cook the crust on. I used my pizza stone the first time without the parchment. It was a bit difficult to remove from the stone. The second time I used the parchment ….much easier to remove and serve. Cooking the crust before topping is a must. At least 15 minutes. 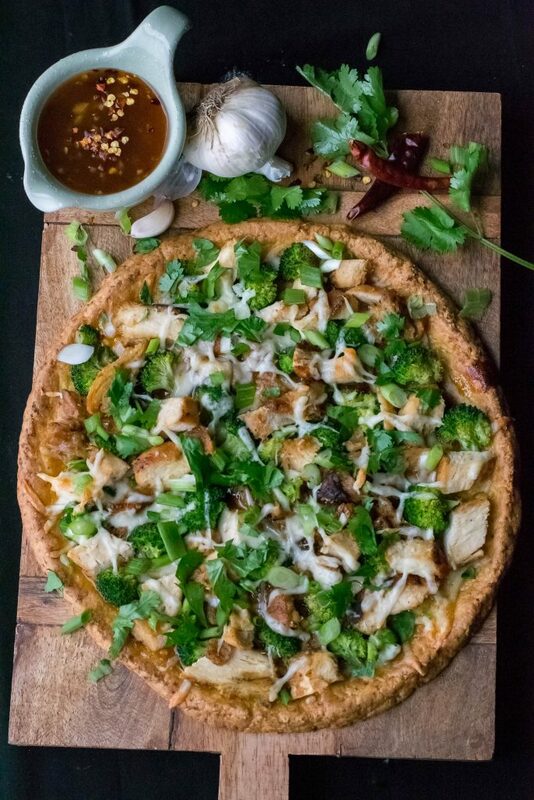 If you are looking for an alternative to the traditional pizza crust, for whatever reason, cauliflower crust is your new crust! All the ingredients make for a fairly healthy pizza. The sweet chili chicken wrap that Tim and I loved so much had chicken, sweet chili sauce, a spring lettuce mix and cucumbers. Not quite the right ingredient for pizza, so a swap was in order. Precooked chicken either frozen or from your local deli helps make this a hurry up meal. I used frozen grilled chicken strips, chopped, but any leftover chicken will do. Instead of cucumber, broccoli, and a mixture of green onion, and cilantro instead of lettuce. Mozzarella cheese as a base topped with the sweet chili sauce, chicken and broccoli, then a touch more cheese. Use a light hand with the cheese, so the flavors of the sauce shines through. 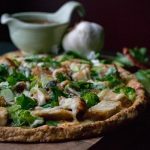 Sweet Chili Chicken Pizza with Cauliflower Crust is a yummy outside of the box pizza that we will be sure to make again and again!!! Microwave riced cauliflower for 4 minutes minutes you do not need to add water. Transfer cooked riced cauliflower to a fine mesh strainer lined with cheese cloth and allow to drain. When cool enough to handle wrap the sides of the cheesecloth around the cauliflower and squeeze out excess water. This step is very important, the dryer the better. In a medium bowl whisk eggs, garlic, seasoning, and parmesan cheese. Stir in dried cauliflower and mix well. Place a sheet of parchment paper on a pizza stone or baking sheet. If you have a pizza stone I have found this works best. Place you cauliflower dough on parchment paper and press into a 10 inch circle. Do not press too thin, it is easy to create hole. Bake dough in preheated oven for 15 to 20 minutes, until nicely golden brown. After removing cauliflower crust from the oven, sprinkle 1/2 cup of the mozzarella cheese on the crust. 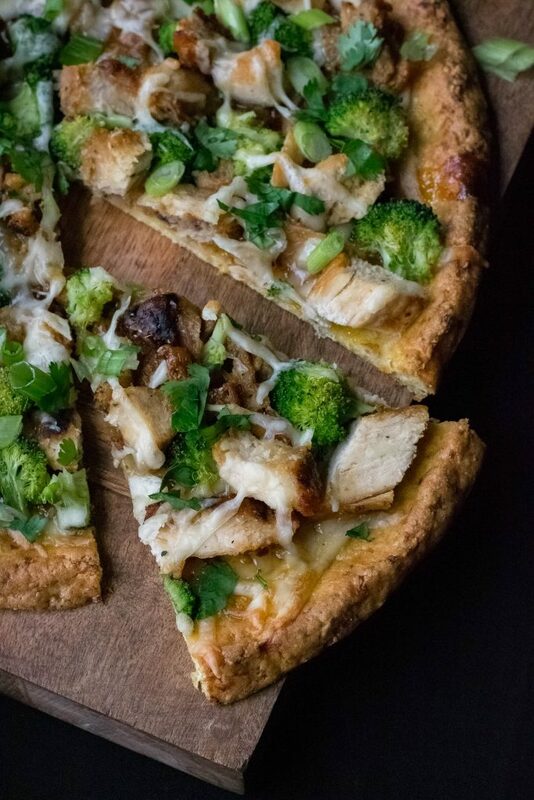 Drizzle sweet chili sauce over cheese, then top with broccoli, chicken, and remaining mozzarella cheese. Return to 450* degree oven for 5 – 10 minutes and bake until cheese has melted and pizza is heated through. Place under the broiler for a few minutes if like a browner cheese. Garnish pizza with green onions, cilantro and extra sweet chili sauce.